Individual exhibition comprising six interactive installations, four site specific murals, two bio-installations and an archive room. Galería Ze Dos Bois de Lisboa (Portugal), May to July 2008. Outras peles in an attempt to impose some order on the complex cosmos of Marcel·lí’s work. This ambitious exhibition occupies thirteen rooms spread over three floors of the Ze Dos Bois building. Spectators can observe one work in each room. The variety of the works and the architecture of the building set an evocative and intense rhythm, something like a Luna Park. 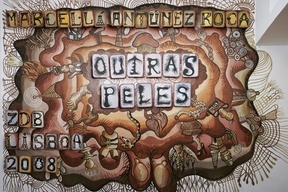 Following the route of the visit, the first work at the entrance is the site specific mural Outras Peles (2008). On the first floor one finds the audio-installation Alfabeto (1999), the bio-installation Agar (1999) and the interactive installation Tàntal (2004). Also on the first floor are the Transpermia (2004) room with drawings mounted on a site-specific mural that occupies the whole room, and the interactive installation Hipnotoc (2008) in the last room. The exhibition continues with the site-specific mural Árbol Sistematurgico (2008) located on the stairs that joins the first floor with the second. Next is the DMD Europa (2007) mural room, an interactive animation, and the Membrana room, in which a site-specific mural frames the root-drawings for the Protomembrana (2006) and Hipermembrana (2007) performances. This is followed by the interactive robot Réquiem (1999), the interactive installation Epidermia (2008) and, completing the route, is the bio-installation Metzina (2004). The exhibition concludes with the Archive room showing the film El Dibuixant (2005), videos of his performances and some workbooks containing drawings and sketches. To celebrate the exhibition a book/catalogue will be published by the exhibition curator, Natxo Checa, and designed by Barbara Says. The book will contain texs by Pere Salabert, Pau Alsina, Natxo Checa and Marcel·lí Antúnez Roca, among others. With the collaboration of: Sociedad Estatal para la Acción Cultural Exterior de España (SEACEX), Directorate General for Cultural and Scientific Relations of the Spanish Ministry of Foreign Affairs and Cooperation, Institut Ramón Llull, Instituto Cervantes.